TREIRB JL Junior Lecturer Posts Recruitment notification to be released for fill up the below mentioned posts in TS Residential Institutions through Direct Recruitment - Telangana Gurukulam Recruitment Board JL Junior Lecturer Posts in TREIS Instituitions. Applications to be invited Online from qualified candidates through the proforma application to be made available on Board’s TREI-RB WEBSITE (www.treirb.telangana.gov.in) to the post of Junior Lecturers in Residential Educational Institutions Societies. 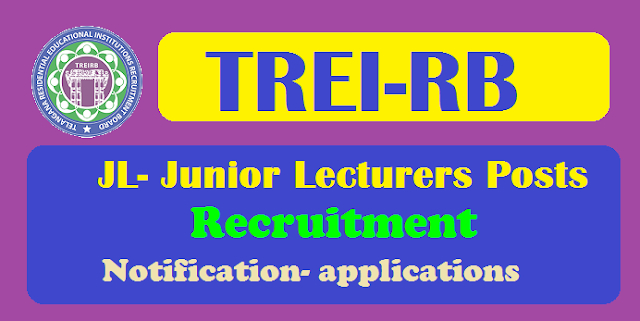 So, Telangana Residential Educational Institutions Recruitment Board (TREI-RB), Hyderabad would invite applications for the post of Junior Lecturers in Residential Educational Institutions Societies. Welfare Residential Educational Institutions Society. Telangana Tribal Welfare Residential Educational Institutions Society. Telangana Social Welfare Residential Educational Institutions Society. Telangana Minorities Residential Educational Institutions Society. 3. The candidates who have obtained Degrees through Open Universities and Deemed Universities/ Distance Education mode are required to have recognition by the University Grants Commission, Distance Education Council (DEC), All India Council for Technical Education and with Jurisdiction to operate such courses; in the State of Telangana/Andhra Pradesh as case may be. Unless such Degrees have been recognized by the relevant statutory Authority, they will not be accepted for purpose of Educational Qualification. The onus of proof of recognition by the relevant Statutory Authority that their Degrees/Universities have been recognized rests with the Candidates. Note: Provided these candidates should have studied the subject Physics at B.Sc. level. specialisation/ M.Sc. (Tech) Instrumentation/ Any Physics based on M.Sc. Course/M.Sc. (Engineering Physics with instrumentation) of Kakathiya University/ M.Sc. (Technical Engineering Physics) of S.V. University / M.Sc. Astro Physics of Osmania University. Botany subject at their graduation level. M.Sc. Life Sciences of Berhampur University provided that the candidates opted for plant sciences in 2nd year/ M.Sc. Plant Science of University of Hyderabad. Note: Provided these candidates should have studies History as one of the subjects at B.A. Degree level. M.A. Indian Culture of S.V. University/M.A. History, Archaeology and culture of Dravidian University/M.A. Ancient Indian History and Archaeology of S.V. University/M.A. History, Archaeology of Andhra University. NOTE:- Subject wise vacancy position is available at ANNEXURE-I (Pages 13 to 20) and candidates may apply as per the vacancy position in their concerned subject. GRADUATION, B.Ed., etc. and their Roll numbers, Year of passing etc. iii) Community/ Caste Certificate obtained from Mee Seva/ E Seva i.e., Certificates number and date of issue etc. Paper-I, II & III are Objective type. The Board reserves the right to conduct the Examinations in OFFLINE OMR mode..